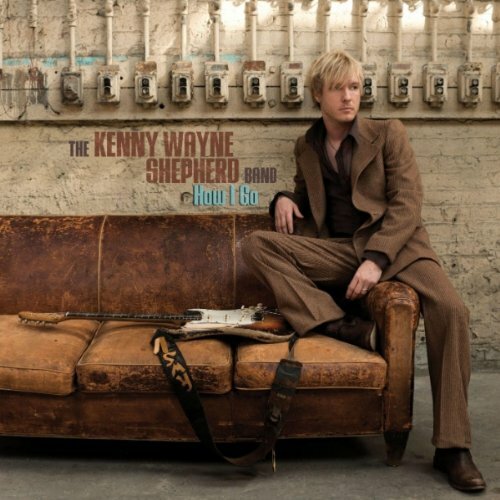 Kenny Wayne Shepherd was a stringy-haired blonde, 18-year old kid when he burst onto the world stage from his native Louisiana with Ledbetter Heights. The album went platinum and a phenom was born. It's hard to believe halfway into his second decade as a recording artist, Shepherd, 34, is now a married father of three. Where does the time go? I bring this up because I always thought of Shepherd in terms of being a kid, a child prodigy. He's three years younger than I am! It's time to find a new prism through which to view Shepherd. I don't see how I can be an old grouch and he can still be a kid, unless age really is just a number. How I Go follows up Shepherd's Blues Music Award-winning Live! In Chicago. Former Talking Head Jerry Harrison produced the sessions and Shepherd's band still includes keyboardist Riley Osbourn, former Double Trouble rhythm section Chris Layton and Tommy Shannon, and vocalist Noah Hunt is still out front. The standard issue of the album is a hefty 14-track effort – the special edition includes an additional three – and after one listen, I was fatigued by what felt like an overly loud, long set. I haven't completely abandoned that position but I've come around and my analysis of the record has evolved a little. It's no surprise the opening track "Never Lookin' Back" was chosen as the first single. It feels like an updated version of the slick '80s ZZ Top sound. It's an otherwise predictable blues-rocker with keyboards that are a lot less cheesy than the synths used by the little band from Texas percolating beneath. Where the ZZ Top singles were bawdy fun, Hunt and Shepherd embrace maturity with stock issue lyrics that neither insult nor inspire. Much of the record follows that same pattern as How I Go relies heavily on standard blues-rock conventions, but Shepherd varies his tone just often enough to prevent a descent into blandness. There are exceptions. "Who's Gonna Catch You Now" sounds like the kind of song country-rockers Lonestar could have turned into a hit. The harmonies are manicured and marred a little too much by the production but it's a pleasing song with modest radio potential. Blues purists will hate what the band does to Bessie Smith's "Back Water Blues" but it's actually not bad when you put it in context. The band plays it for fun, not to appease or appeal to purists. That relaxed attitude of comfort and confidence is a key to what make these songs work, despite the journeyman, blue-collar earnestness that permeates. It's an odd concoction of slickness and sheen mixed with everyman tales and FM radio-ready rock. Surprisingly absent from the collection are any standout solos from Shepherd. His playing is strong and ever-present but doesn't dazzle. How I Go is a well-crafted, professional effort and whether taken as a 14 or 17-song set, there are no real clunkers. There are, unfortunately, only a handful of moments that rise above the rest, making it more than passable but not remarkable or revelatory.